Help a woman and her son Jacob to pay money back to a creditor! The Golden Years: Way Out West was available as a giveaway on January 13, 2019! As you use your business savvy to squeeze every ounce of profit from your investments, you'll help an iron-willed woman and her young son overcome the sleazy maneuvers of a greedy ol' rip and save her guiltless husband from a life behind bars. 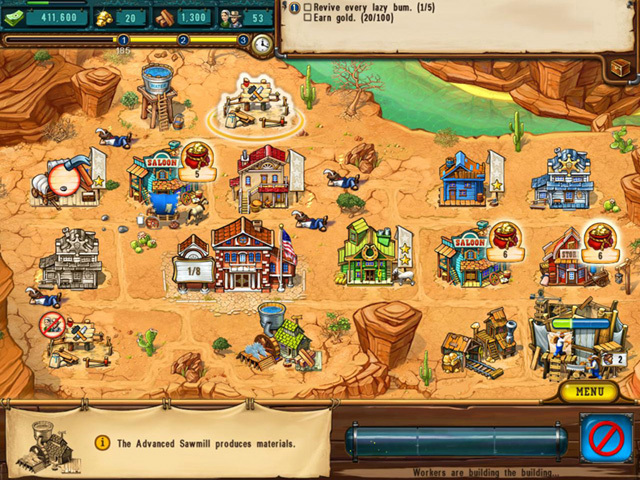 Progress through challenging levels and save the day in The Golden Years: Way Out West! 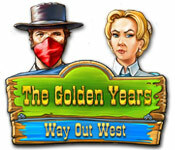 How would you improve The Golden Years: Way Out West? This game involves building a community. 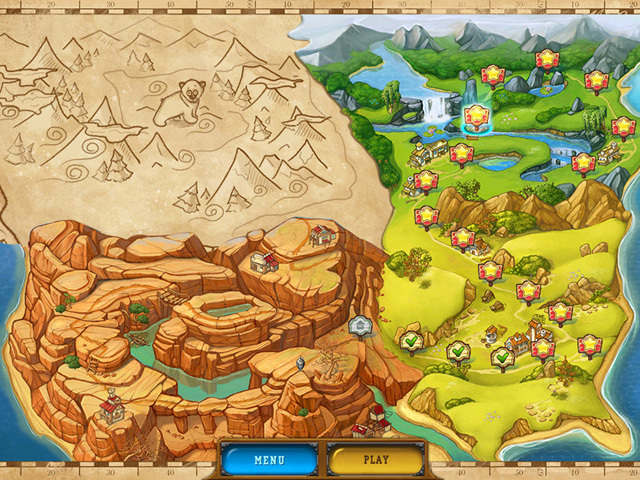 You start from scratch every level with different resources. Collect Materials - some from the road, but mostly from buildings. 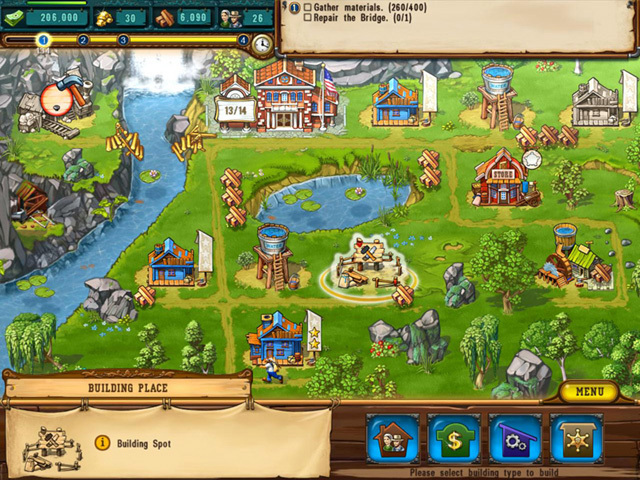 - Although you can go to the sawmill to buy wood it will also auto-generate resources there. But you have to send a worker to fetch it. - Rent is automatically collected. - Resources have to be collected - even if you demolish a building, you have to send someone back to collect the resources. - The more wood you buy the more workers you need to send to carry the wood back etc. You cannot click ahead and queue tasks. You need to have a worker available. Although this game is well made and looks good I found no reason to play it. 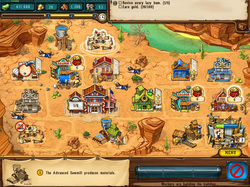 The tutorial was tedious because you have to do exactly what it tells you to do before you can continue, but without it, one couldn't finish the game as there were a few things that weren't intuitive - like looking for gold at the river or "mining" it from the general store. In later levels the tasks are given one or two at a time so that you're just going through the motions and doing the next thing. Buildings need to be repaired quite often. I only found some strategy on 2 levels out of the 1st 10 - and these were rather that you didn't know things upfront - for example you don't know that you can only have x number of workers based on population. So you might upgrade your house for money and then discover you need more population and then you're stuck - you have to demolish them and rebuild or restart. But this isn't strategy - it's just finding things out too late. You're going to replay the level knowing exactly what to do and that's just boring. Despite this, and demolishing buildings and rebuilding them I got an expert pass on every level - although not all the stars. The only "bug" I found is when the pop-up says "Click to Continue" it means - do the action she says, to continue. If they had given one all the tasks upfront and you had to plan a strategy to complete them all it would have been a lot more fun. 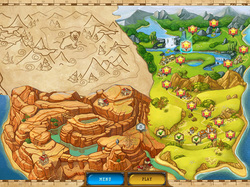 However, if you enjoy these games to pass the time and you're not a strategy junky then you'll probably enjoy this one. Thank you for your excellent review A Reviewer, appreciated. I've placed your review on top so that it will remain their no matter who else posts a comment. This is the same game given away way back in June 2014, right? Reminds me a little of the Westward, Westward II, etc. series which I found very complex and enjoyable. This, not so much. It just seems like the usual time-management game. I played this game on my tablet and remember it being quite enjoyable... once you figure out the requirements needed before you can build in certain areas. The most important thing, as I recall, is that you need a WELL near a location in order to build a structure on that location. It's not immediately intuitive which nearby spaces will be affected when you build something, at least on the tablet version. There's a highlight effect when you click on the building you want to build that shows you what other nearby spaces will be affected by that building, but it's easy to overlook it. I'm just downloading this version of the game now, so I'll see if it's the same here, but I expect it will be. I played this game on my tablet and remember it being quite enjoyable... once you figure out the requirements needed before you can build in certain areas. The most important thing, as I recall, is that you need a WELL near a location in order to build a structure on that location. It's not immediately intuitive which nearby spaces will be affected when you build something, at least on the tablet version. There's a highlight effect when you click on the building you want to build that shows you what other nearby spaces will be affected by that building, but it's easy to overlook it. I'm just downloading this version of the game now, so I'll see if it's the same here, but I expect it will be. Thanks for the up front review. Mirrors my initial mind flash, oh geez more work. Small wonder how many these drudge games are being offered as giveaways. Only saving grace seems to be they set the fun floor so the fewer strong, engaging games stand taller. Guess less of us can do a winning film, novel, song than can do cut & paste cloning. Thanks anyway for offering something, but also for transparency about game play. Nice to see users replying with game's tips. Thanks for the up front review. Mirrors my initial mind flash, oh geez more work. Small wonder how many these drudge games are being offered as giveaways. Only saving grace seems to be they set the fun floor so the fewer strong, engaging games stand taller. Guess less of us can do a winning film, novel, song than can do cut & paste cloning. Thanks anyway for offering something, but also for transparency about game play. Nice to see users replying with game's tips. On level two and I have build both homes and have my income up, but it isn't ticking off the box for income. I am just stuck and can't go on. What should I do? You have to upgrade your homes. On one of the levels there was some gold next to the water / dam that you could pick up that would give you more gold to continue upgrading your homes. You have to upgrade your homes. On one of the levels there was some gold next to the water / dam that you could pick up that would give you more gold to continue upgrading your homes. You can only build a covered wagon / house etc. next to a water tower. So build a water tower first then it will allow you to build more covered wagons. sherry storey, You can only build a covered wagon / house etc. next to a water tower. So build a water tower first then it will allow you to build more covered wagons. @sherry storey, Find a solution. Hope that helps. Build a sawmill to the left of the Workers' House. Build on the right side, middle row, middle plot, one well. Produce 500 units of wood. Values two wagons with 3 stars and 2 wagons with 2 stars on. @sherry storey, Find a solution. Hope that helps. Hire 3 workers. Collect wood and gold. Build a sawmill to the left of the Workers' House. Build on the right side, middle row, middle plot, one well. Produce 500 units of wood. Build four covered wagons. Values two wagons with 3 stars and 2 wagons with 2 stars on. Have great day ! Also sometimes you need to demolish buildings first - then place a water tower in the right place - then build the homes around it. sherry storey, Also sometimes you need to demolish buildings first - then place a water tower in the right place - then build the homes around it. I cannot get the game to install. I get to successfully activated, but the game does not install after this. The animation and the game characters are very sweet and cute. I have played much, just few stages. But very good game. The animation and the game characters are very sweet and cute. Very pleasant to watch. I have played much, just few stages. But very good game. Thank you for this.